Using raindancer is very easy and it is available for every irrigation machine. Regardless if it is old or brand-new. It can be mounted on hose reels, pivots and linear machines. The raindancer module is built from an heavy-duty polycarbonite casing and a solar panel covered with a special. It is highly splash water and dust resistant. The complete assembly is mounted on a corrosion resistant aluminum platform. This platform makes mounting to your gun carriage very easy. Besides the strong solar panel there is also a 4.000 mAh built-in battery. This combination makes a non-stop usage throughout a complete season possible. 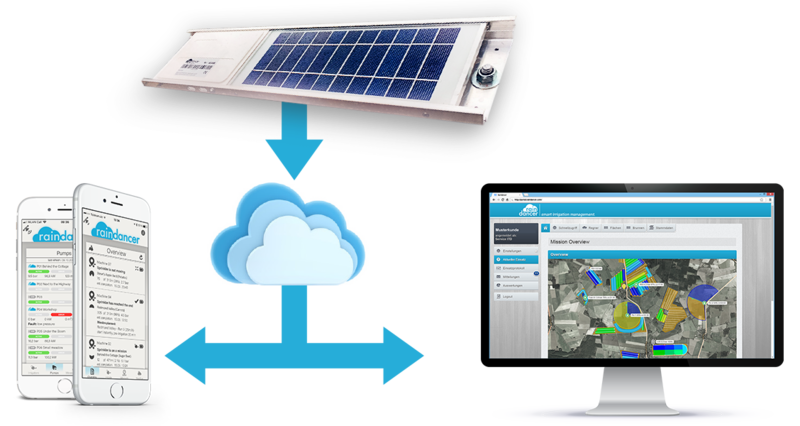 Raindancer works with a cloud based server-client technology. All data will be transmitted to the server-infrastructure and stored securely and properly. You will be granted access to a comprehensive and easy to use online portal. This allows you to access your data at any time, no matter where you are. In addition to the classic online portal we offer you a completely free app for your smartphone. With this app you will keep track on your irrigations even when you are on track yourself. For a deeper look into the functionality and advantages of the App and raindancer take an look at the Functions page. Gyroscope sensors, accelerometers, GPS and pressure sensors allow an overall picture about the state of your equipment and your irrigation. With this wide set of sensitive sensors, you can quickly control unplanned circumstances. Whether it is a tipped gun carriage or a spontaneous pressure drop. Raindancer will inform you if you are required to take action. Furthermore, your raindancer equipped machines are protected against theft. 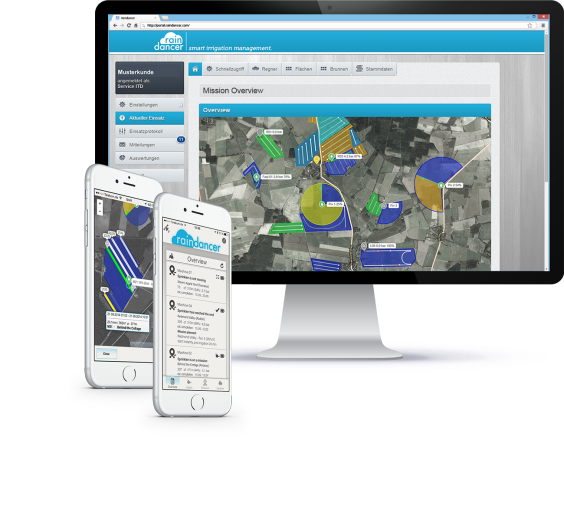 Once one of your machines leaves the action corridor of their current irrigation process, raindancer will notify you or your team immediately so that you can act before it is too late.